Well, a fair few changes by Apple yesterday with the big news item the iPad HD. 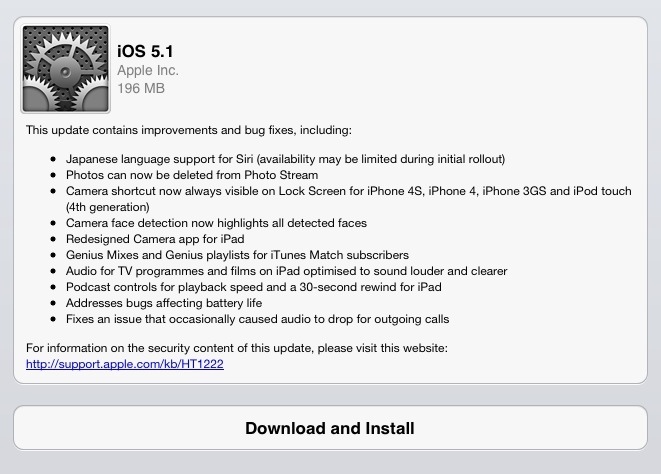 Along with that keynote speech came an update to the iOS that powers all Apples iPhones, iPads and iPod Touch range. This is the second update to make use of Apples new Delta Updates, essentially patches to the installed iOS rather than a new complete image. The primary advantage is that it can be done over WiFi rather than tethered to your PC/Mac. Indeed if your broadband is up to it you could update multiple devices at once. 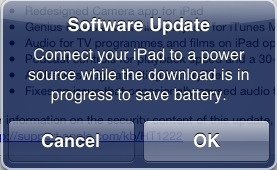 This feature is sometimes called OTA (Over The Air) updating. The second advantage is that the updates are much, much smaller – Only 189MB. In this case the download was just minutes even on my puny 1.5Mbps connection. With three devices to update this is very welcome. Again the update was not completely painless but was simple enough. To kick off an update simply open Settings, select General and then Software Update. From here on all you need do is follow a few simple on screen instructions. One thing to look out for is the free space requirement. Because the unpacking and installation is taking place on the device itself you need enough room on the device to accommodate the downloaded package, the uncompressed updates and all your usual stuff. This requires 1GB of free space. In my case I decided to delete Infinity Blade and Guitar Hero in order to proceed. Apple recommend that you leave the device connected to mains power during the update. I have to agree as it takes a while and requires a fair bit of grunt to process. If you were as lucky as me the rest of the process is entirely automated and takes between 1/2 hour and 45 minutes. If your broadband is fast the first phase will be but a minute or so, the rest though is the same for everyone so no real gain. The device is still functional whilst downloading but then requires absolute control of the device in order to install the update. The device will prompt you before initiating the final stages of installation with an alert and countdown. The device will then reboot at least twice, once to install new hardware controllers (called the firmware) and once to apply changes to the iOS and intrinsic applications. Once the installation is complete then you are done. As this is a Delta Update there is no big announcement screens showing you what’s new, the device just starts as normal. Not a huge amount has changed with this update. The primary function is to support the new range of 4G and HD devices also announced on 07/Mar/2012. There are a couple of interesting things though. I can’t review many of the options here as my devices are not suitable, or I lack appropriate skills. I have the iPad 1, iPhone 3GS and iPhone 4S and do not speak Japanese. The Camera is available now without the Double Tap that was required previously. This change was probably prompted by the number of people kicking off Siri accidentally. Touch embarrassing that. Now the camera is simply available after swiping UP on the lock screen. This is much simpler to operate and still leave the device locked, as before, keeping your photos private. Interestingly, the Photo Stream appears to be unique to each device. This has allowed Apple to offer you the ability to delete an image off the Photo Stream but only for the device you’re on. Bit of an odd one that. If I delete an image off Photo Stream I want it deleted off ALL devices. Perhaps a better option is to only allow you to delete photos uploaded from that specific device but they are removed from all devices sharing the Photo Stream? Any way, this works and is a welcome, if incomplete update. Waiting for images to time out off the Photo Stream is annoying – especially if you’ve been stupid enough to not lock your phone around your friends. Apple have taken note that Applications are now larger and that the new HD devices they are providing also push applications into a larger scale. Thus they have increased the size limit for 3G/4G App Updates from 25MB to 50MB. Probably welcome change for some but not in the UK I would guess. Most users are on 500MB or so and thus losing 10% of your monthly allowance for each App Update is a big hit. 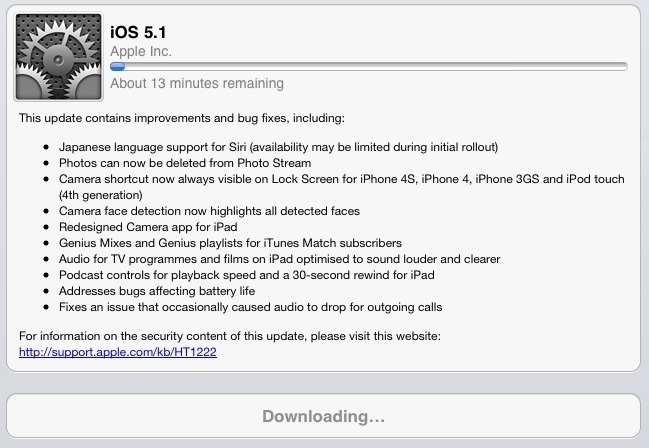 Perhaps this should be configurable – possibly give users the option to only update over WiFi? Well, this is very welcome. Testing shows me that the iOS 5.1 update has fixed the issue where, on loss of signal, the device took an age to find it again. I’ve previously seen the iPhone 4S take nearly 5 minutes to find signal again. That was prompting commuters like myself to repetitively switch Airplane Mode on and off to force the device to search for the network again. Now it seems the device can rediscover the cellular network within seconds. So far it has not taken longer than 10 seconds for me. Anyone who read my rant about the original version of iOS 5 will know that the breaking of the iPad Music app caused me pain. The iOS 5.0.1 fixed playback issues and now Apple have gone one step further and placed the 30 second rewind and multiple speed playback options back into the application. Well done Apple but I do question any research that you did that told you removing them in the first place was good idea. This iOS update really is about supporting features in new devices and not really about improving the experience for the current install base. Apple still need to learn that some options need to be user configurable. Yes, a default is required for a lot of less tech savvy users but corporate and geek users will want to play with settings like the maximum OTA app update size. For me, the big gain is the fix for the signal drop issues on the iPhone 4S.